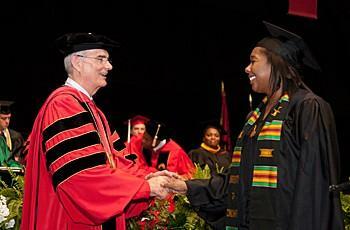 President Williams congratulates a member of the Class of 2012. 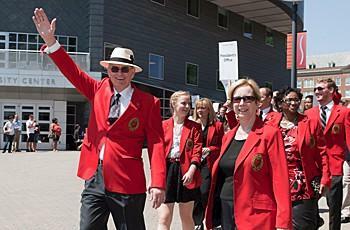 President Williams and Executive Vice President Karen Faaborg lead the way for the MainStreet Stride in May 2012. University of Cincinnati president Gregory Williams is resigning. The announcement comes less than a week before classes begin. In a statement, the university says Williams is resigning because of personal reasons. UC's Board of Trustees met for several hours Tuesday. Provost Santa Ono will fill the position in the interim. Williams joined the university in 2009 having served previously at The City College of New York. He also sits on the board of the Cincinnati USA Regional Chamber. It's unclear whether he'll resign that position as well. You can hear WVXU's November 2009 interview with Greg Williams here.